On a windless morning in late October, John and I left the dock and headed for a remote lagoon on the Lower Laguna Madre. The lagoon is usually too shallow to hold fish, but during the high tides of spring and autumn, it attracts impressive schools of redfish feeding on shrimp. Depending on the tidal flow, the schools may break up into singles and roaming pods, or they may congregate in schools that sweep slowly around like folk dancers with arms entwined. When we entered the lagoon, the mirror-like surface telegraphed the movement of every fish in the vicinity. Deep retreating wakes told us that the area was full of reds, and that to go any further would risk terminally offending our hosts. So I cut the motor, and poled the Curlew toward the middle of the small bay, while my companion opened his fly box and contemplated her choices. “What are you going to use?” I asked. “Topwaters, don’t you think?” he replied. I wasn’t surprised to see him reach for a VIP popper that I’d tied for him the night before. I staked the boat, and tied on a VIP, too. The tiny popper was more refined than the deerhair popper that I used to take my first Laguna Madre red on a fly 24 years earlier. But I’m not sure the fish could tell the difference. The action was intense. Casting to swirls, wakes and tails, we drew explosive strikes from fish that often missed the first time, but came back again and again until hooked. I wish I could say that we did everything right from the first moment, but in our haste to be on the water after weeks of hosting other fly fishers, we had not taken the time to replace old leaders and knotted tippets. Not surprisingly, we managed to hook three reds apiece -- only to lose every one of them within the first few seconds! To be fair, the fish made it more difficult than usual by dragging our leaders through algae that clung to the bottom, but regardless, we weren’t feeling very good about our angling skills up to that point. We went on to catch and release several reds that morning in conditions that would have defeated us if we’d been using subsurface patterns of any description. But even if the water had been clear of vegetation, we would have used our topwaters, anyway. For, after years of stalking redfish in shallow, clear water, we have found that a properly designed topwater fly can double your strikes, and greatly enhance your angling enjoyment. The Lower Laguna Madre is the largest continuous shallow water estuary in North America, and the only true subtropical saltwater fishery outside of Florida in the continental U.S. Reaching almost to the Mexican border of deep south Texas, it is over sixty miles long and five miles wide. Averaging about a foot deep of water at low tide, it features a wide variety of venues, ranging from small, intimate lagoons, to a vast Carribean-like flat known as the the “white sand.” Full of redfish and speckled trout that spend most of their time feeding in the shallowest waters, the LLM offers visiting fly fishers sight casting opportunities all year round. Feeding redfish become visible on calm mornings whenever they tail, or throw up a V-wake by cruising in less than a foot of water. After the sun rises, their bronze backs and azure tails show up easily in the clear water to anglers wearing polarized sunglasses. Thus, on an ideal day, sight casting can begin at first light and continue unabated until mid-afternoon. Stalking tailing and cruising reds in the Lower Laguna is a high-vis, heart-stopping action that’s hard to beat. Add to that the sights and sounds of redfish exploding on small poppers, and it becomes the stuff which dreams are made of. The choice of the fly definitely matters in becoming successful with this approach, but there’s much more to catching redfish on top than simply tying on the right fly. Several problems have to be understood -- and solutions adopted -- before placing the remaining burden on the fly’s design. The redfish’s mouth and style of attack. The redfish has a small, “inferior” mouth on the underside of its head. When feeding on the bottom, its mouth is well-designed to root out and to seize the prey. But redfish are aggressive gamefish that drive baitfish and shrimp to the surface, too. In these conditions, when the reds finally strike, their heads often come completely out of the water as they lunge forward with their inferior mouths. This movement often causes them to lose sight of the target, and to miss the mark. But they make up for their inaccuracy by striking repeatedly until the prize is won. The stripping method. Because the redfish must lift his head to seize a topwater, the strike is preceded by a bulging wake behind the fly. Eager to close the deal, most fly fishers lift the rod reflexively as soon as the fish lunges for the fly. Since redfish often miss the fly on the first strike, the angler’s reaction almost always brings the encounter to a premature end. To minimize your profile, it’s important to crouch as low as possible -- even to the point of kneeling in the water -- as soon as the wake appears behind the fly. There’s really no need to watch what happens next, because as we’ve already established, the sight of the redfish striking is more of a distraction than an aid. For obvious reasons, casting topwaters from a poled or drifting skiff can result in a lot of spooked fish, especially in close quarters. The last thing you want a redfish to do is to look up and see the boat, so this is one context in which it’s best to leave your topwaters in the fly box. Guides who prefer to pole their clients rarely use topwaters; but this is a decision based on the impact of the boat’s intrusive profile, not the limitations of the fly. In contrast, for those of us who prefer to stalk fish on foot, topwaters can be more effective than subsurface patterns, especially in calm conditions where the fish aren’t showing on the surface, or when they’re tailing with their heads in the grass. Indeed, I’ve seen a noisy topwater attract redfish’s attention from as far away as 15 feet. Just the other day, the advantages of using topwaters for tailing reds were clearly demonstrated. I was guiding two seasoned fly fishers -- Don and Cal Massey. When we came upon several tailing pods of redfish, Cal tied on my favorite shrimp pattern -- a Mother’s Day Fly -- and began wading toward the first pod. Meanwhile Don, who was using a VIP popper, spotted a second pod and set off in hot pursuit. When Cal came within casting distance of his first pod, he placed his fly just a bit short of the tails, and the reds showed no reaction. As Cal kept trying to get the reds’ attention, Don hooked his first red on the popper. After a few more casts, a redfish finally spotted the shrimp pattern, and promptly seized it. But by the time Cal landed his first fish, Don was already battling his second red on the popper. Cal requested a change of flies and, within minutes, handily hooked a redfish on his first cast to a nearby tailing pod. For instance, on a recent calm morning, I left the dock with two guests from southern California. Experienced in various coldwater venues, Richard and Joannie Fanning had never fished the flats of the Lower Laguna Madre. Having observed the couple casting to speckled trout under our lights the previous night, I knew that Joannie had a beautiful casting style, but that she might find it hard to reach the fish with her cast. As we reached the mouth of the Arroyo Colorado and turned northeast onto the foot-deep flats, I pondered our options. If the reds were tailing as they had been, I mused, then topwaters would be the method of choice. I brought the Curlew off plane on a flat covered with sparse turtle grass. We sat momentarily transfixed as an apricot-colored sun appeared above the horizon beneath a bank of fair-weather cumulus clouds. The orb looked to be in front of the clouds, cradled by the distant sand dunes of Padre Island. I wasn’t surprised to see a few redfish tails begin breaking the glassy surface only minutes after I’d staked the boat. Tying small VIP poppers onto their 12-lb. tippets, I gave the Fannings my well-rehearsed talk on using topwaters for tailing reds. “Try not to cast until you can put the fly within five feet of the tail,” I began. “If the tails go down before you get close enough, stop and wait for them to come to you,” I said, realizing that it takes almost inhuman patience to do this. Continuing, I said, “Strip hard a couple of times to get their attention, and then settle into a slow, steady strip. Confident that Joannie and Richard would probably fail the first few times, I nonetheless went on. “When the red approaches the popper, he’ll appear as a bulging wake behind it. Keep stripping! When the fish strikes, keep your rod low to the water, and keep stripping. He may miss the fly the first or second time. Raise your rod only after feeling the fish on the line.” Having finished my lecture, I smiled wryly, knowing that they would learn a lot from the encounter, if nothing else. I waded beside Joannie for a while, and coached her on casting to a few incoming wakes that passed by just out of her range. Since the tails were sparse, the opportunities were few. Then I saw something that explained the paucity of tailing reds. A black seam on the calm surface appeared about 100 yards away, with dark, waving spikes dotting the length of the seam. “A tailing school! That’s where most of the fish are,” I yelled for Richard’s benefit, who was wading 50 yards away. “They may come our way, so let’s get a little closer and see what they do.” Over the course of the next few minutes, the school stayed well out of range, so I headed back to the Curlew to pole it down to our new position. Half way back, I turned around and was surprised to see that the school was approaching Joannie. From where I stood, I could see the line of waving tails getting closer and closer. She remained as stationary as a statue. “Why doesn’t she cast?” I wondered, knowing that any moment one of the reds would spot her. Unable to advise her from afar, I just watched and waited. Finally, she false casted a few times and dropped her VIP in front of the crowd. Crouching low, she began to strip. I could see wakes shoot ahead of the black seam, and then heard the first of several explosions as redfish came out of the water fighting for the fly. Joannie stayed low until one of the fish prevailed. As she raised her rod, the whole school turned away, leaving a half acre of water shaking like jello. Topwaters can serve as a beacon to cruising and tailing reds that might not otherwise see your fly. Using them effectively proceeds from an understanding of how the fish’s mouth affects his style of attack, and limits his accuracy. 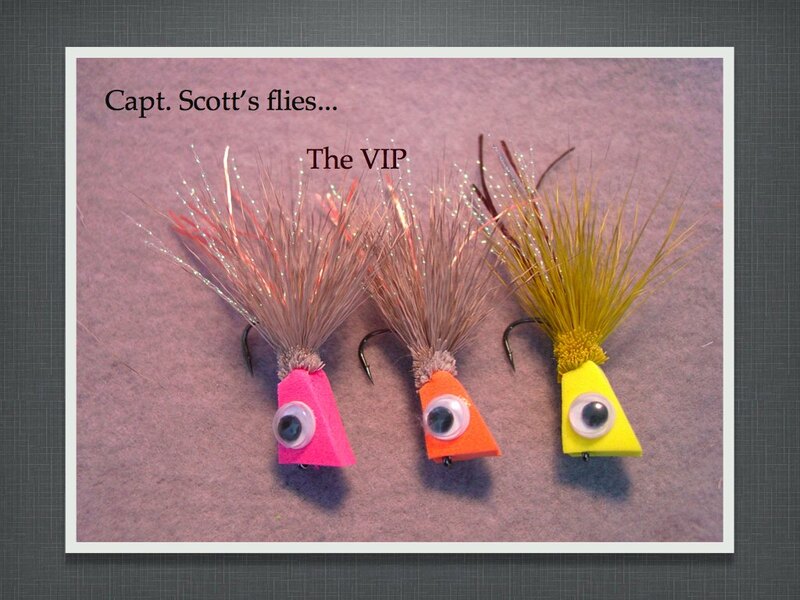 It requires a disciplined approach to stripping the fly and setting the hook while keeping a low profile. And it takes a fly that casts easily, and speaks loudly when it needs to. So the next time you target redfish, consider making a little noise. Whether you prefer to learn by listening, or by letting the fish teach you what you need to know, it’s well worth the effort. For there’s nothing more exciting than catching redfish on top.